We mentioned that Thursday would be a big news day and it lived up to its billing. Futures reacted negatively to poor initial jobless claims and even though they rebounded prior to the cash session open, once equities started trading they sold off to new lows for this leg down. 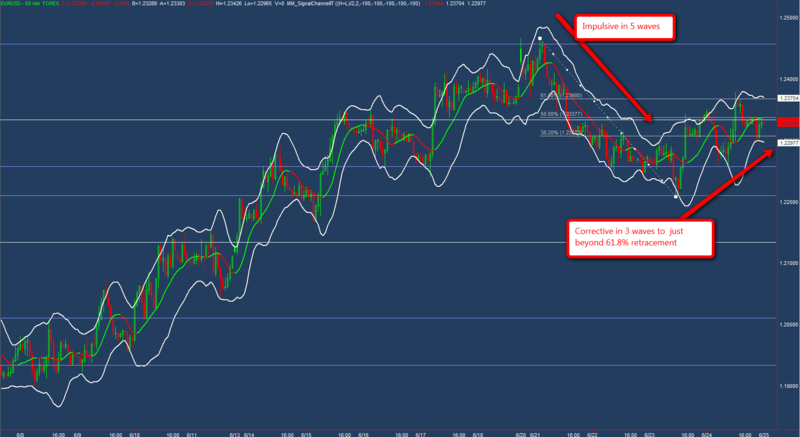 Prices managed to bounce from the lose but still closed down. The new lows told us that the markets will be persistent in reaching to new lows just as the bounce reminded us that it the path will not be straight down. 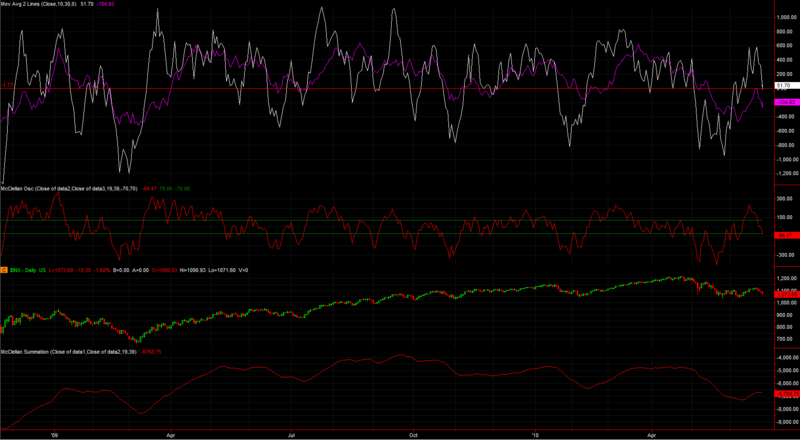 We are still left without guidance to predict when a larger bounce might arise, but we remain aware that one is likely. With little new to say, tonight’s update will be brief. The count remains elusive, but we do present an updated version, but again, we have little confidence in the short-term wave count despite our high confidence in the longer-term count and the longer-term downtrend. Two alternate counts for the up move off of Thursday’s lows identify the possibility that the bounce is over and already turned down (shown in magenta) or the possibility that it will continue higher (cyan). The cyan count of a flat correction would have a reasonable target at approximately Dow 9.800 where C=A and prices retrace 61.8% of the most recent move down. If prices continue much beyond that point, it would be a sign that we are correcting a larger degree wave. While a count of a larger degree five waves down into Thursday’s low doesn’t seem like the most likely count, it is possible. 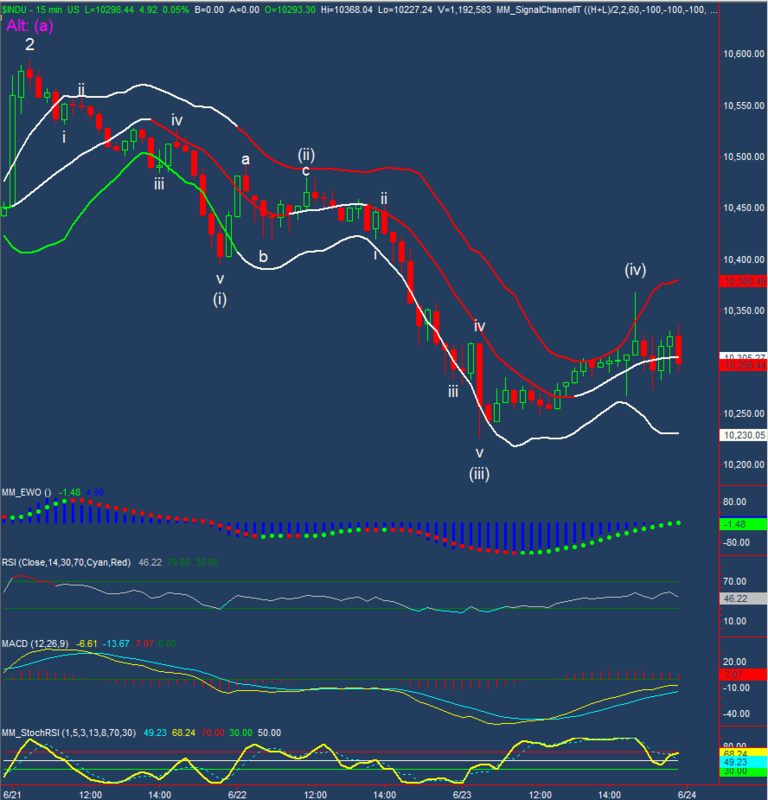 As we’ve said before, we’ll be looking to future price action to confirm any count and so long as a deeper retrace is possible, we need to consider that a larger upward retrace might confirm a completed larger-degree five-wave decline. For Friday, employment data prior to the market open is the big story. As our count shows, one could expect prices to move either up or down. We would expect up moves to be contained. The length of any down move would depend on the current count. Have we mentioned that the short-term count is in limbo? The most significant clue seems to be that the move down into Thursday’s lows appears to have unfolded in three waves. If that observation is correct then it should cap both the immediate upside, keeping prices below the 9,915 snow line until a new low is made. 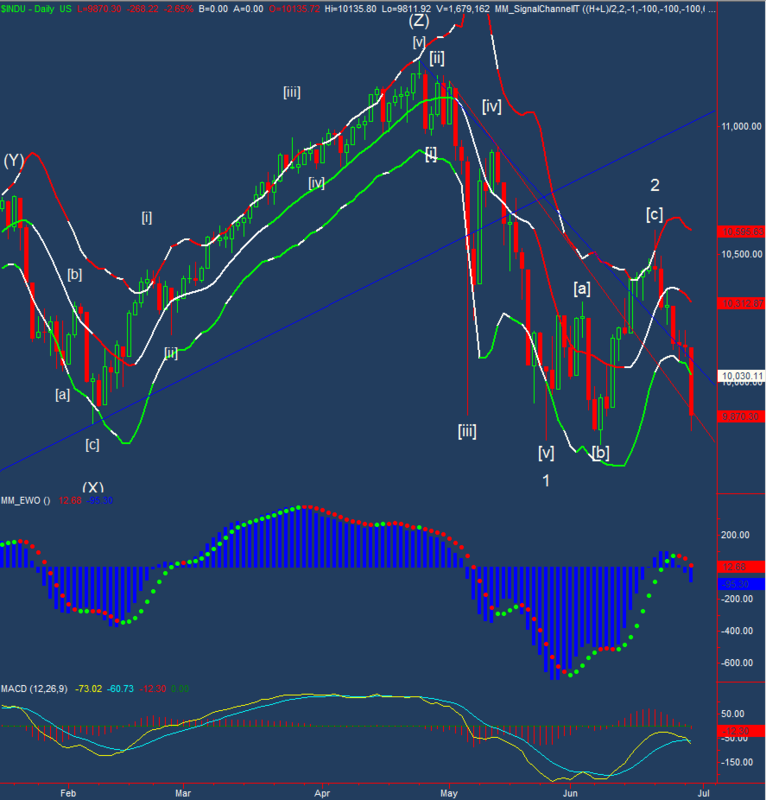 However it should also keep the downside limited since that new low would be a relatively small degree fifth wave. We’ll say it again, however, since the account is not entirely clear, any prediction based on wave count should be confirmed before relying on it. As I write this morning, Dow futures are down 55 points. Of course, that’s the perspective r an hour before the release of May durable goods orders and last week’s initial jobless claims, so anything can happen by the time the bell rings. Any big gap (up or down) challanges us by hiding the underlying wave structure. A gap of 55 points could be a half to a third of the entire move down we expect for a wave (v). Should that move come on a gap, we’ll have a hard time figuring out if the move counts complete in our target range. Such is our lot. If we ask ourselves what the gap could hide, we can see that we haven’t fully considered the scenario of five waves down into Wednesday’s low shown as an alternate count in magenta on a 10 minute chart. We dismissed this count without directly addressing it, so let’s talk about it. This magenta alternate counts a triange where there is a properly formed triangle shape. This is probably the single most attractive thing about the count. The reasons to dismiss it were burried in other discussion. Aside from having an rather extended fifth wave, the move doesn’t look good on technicals. 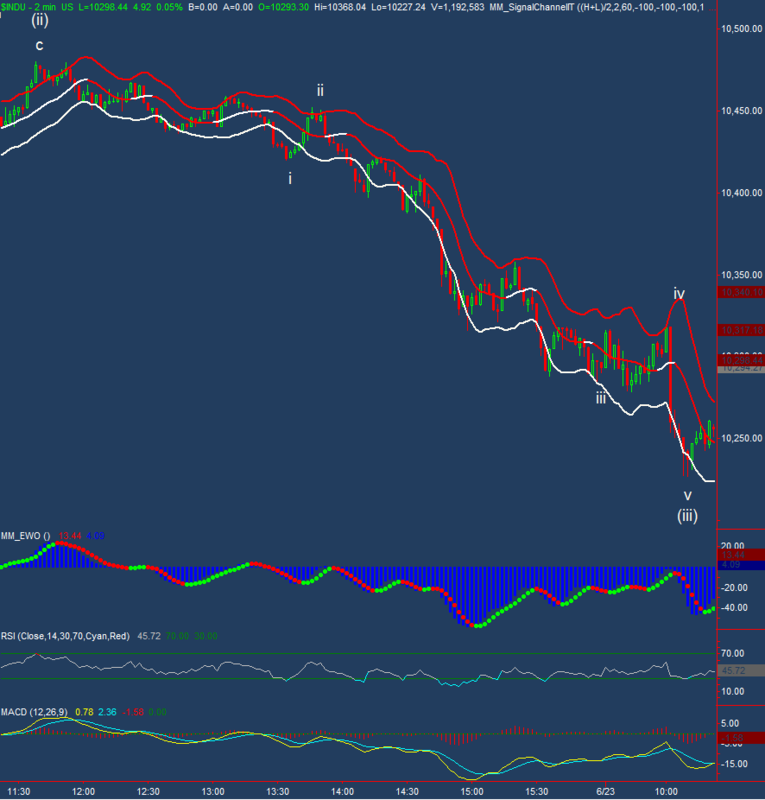 MACD and EWO lack divergences at fifth wave lows. We switched to a 10 minute chart because it’s more appropriate for looking at technicals on a move of this length, although the technical picture is even more pronounced on a 15 minute chart. A second factor to recommend this count is the fact that Wednesday’s post-FOMC bounce retraced 38.2% of what would be a five wave move. This is an indication that markets recognize the move as an entity. Let’s be clear, this isn’t our most likely count, but we do need to consider it. Therefore, we also need to consider the possibility that any move downward from Wednesday’s high has us in wave (iii) down and that’s where a gap open is problematic: if we can’t count a significant portion of the next move, then it may become more difficult to tell which case is more likely.